National Food Days: Get FREE Food 40+ Days of the Year! Have you heard of National Food Days?! I always thought they were stupid until I learned about all the free food I was missing out on! It turns out these silly, made-up dates are great for grabbing free food at your favorite restaurants. After all, free food is 100% more delicious than food you have to pay for, right? I’m pretty sure that’s science. If you love to eat, then you’ll rejoice to know that there are some recurring national food days that offer free food every year! These dates include Tax Day and Veteran’s Day, but they also include delightfully bogus free national food days like “National Cheeseburger Day.” On these days, certain restaurants offer free food. Sounds great, right? It is important to realize that, although I’ve spent dozens of hours researching this article for you, these deals are subject to change at any time and may vary by location. Always call ahead to confirm that the deal is valid in your area! Pick up a free coffee from Sheetz before 4pm on New Years’ Day! Is there anyone that doesn’t love cheese? I’m not sure. What I do know, though, is that we can snag a free bowl of queso from On the Border for National Cheese Lover’s Day! The only downside? You’ll also need to buy an adult entree. On National Cheese Lover’s Day, you can also get free chips and queso with any purchase from California Tortilla. All you have to do is say “I love cheese” when you place your order! It appears that some grocery stores, like Whole Foods, may also offer free cheese tastings on this national food day! Chick-Fil-A may provide free spicy chicken biscuits on Groundhog Day. It appears that this deal is only available in certain areas around the country, so definitely call ahead of time to confirm this. Binge on free bagels today from Blazing Bagels, Bagels & Brew, Spread Bagelry, Manhattan Bagel and more. You can also get a free bagel with an additional purchase if you visit Einstein Bros. Bagels, Panera Bread, Noah’s Bagels, Balsam Bagels or The Original Brooklyn Water Bagel Co.
That’s right – February 9 is also National Pizza Day! You can get free slices of pizza at Pilot Flying J. You can also get a free personal pan pizza from Round Table Pizza but only if you purchase a Pepsi product. In the past, Baskin Robbins has offered free samples of ice cream Polar pizzas on this day. I’m not sure if that is going to be repeated, though. Bring your sweetheart (or your fabulously single self) into these restaurants for a delicious free treat on Valentine’s Day! 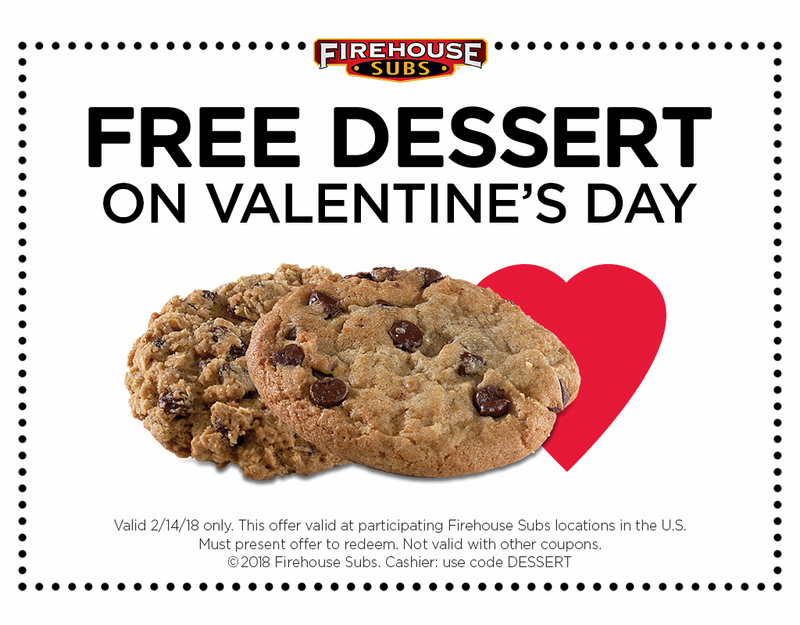 Firehouse Subs will give you a free dessert on Valentine’s Day. Quiznos provides a free Lobster & Seafood sub to customers who use their Toasty Points loyalty app. In 2018, Qdoba offered a promotion where you could get a free entree “just by sharing a smooch with anyone or anything (even your burrito!) at checkout.” It’s not clear if this will be offered again in the future, so be sure to confirm the deal before you pucker up. In the past, Chuck E. Cheese has also offered free downloadable cards that are redeemable for tokens and by distributing free brownies on Valentine’s Day. Planning to get propose? If you pop the question in Mimi’s Cafe during your three-course meal, then your meal (and your fiancee’s) will be free! However, there is one catch: a ring is required in order to get this discount. Post a picture of your proposal on their Facebook page for the chance to win a $500 Mimi’s gift card! You can also get a slew of BOGO deals. You can score BOGO deals from Auntie Anne’s, Starbucks and more! National Pancake Day is celebrated on Shrove Tuesday (Fat Tuesday), which is always 47 days before Easter. On this national food day, IHOP will give you a free short stack of pancakes! If you are a “Leapling,” or someone born on Leap Day, then you can score all sorts of extra freebies and deals! You will need to provide valid photo ID with your birthdate in order to receive these deals. Those who weren’t born on Leap Day can still score some great deals! In 2016, several Chick-Fil-A restaurants provided free spicy chicken sandwiches and Chili’s provided free queso and chips. I’m not sure exactly what 2020 will bring, but I can’t wait to find out! Whether you prefer pizza pie, pot pie or dessert pie, there are all sorts of discounts and freebies available on International Pi Day! Of course, the mathematical constant of π (pi) is a trillion digits long but is usually rounded to 3.14. That’s why we celebrate it every year on 3/14! Since many restaurants have coyly discounted their products to $3.14 to celebrate, we’re including some items in this list that aren’t exactly free. They’re still discounts, though, and we thought you’d want to know! Want a cheap pizza? BJ’s Brewhouse & Restaurants offer a mini one-topping pizza for $3.14. Papa Murphy’s provides a large, thin one-topping pizza for $3.14 also. Blaze Pizza, Fired Pie, Firenza Pizza, Flippers Pizzeria, Giordan’s, In Vicino Wood Oven Pizza, Me-n-Ed’s Pizzeria, Pagliacci Pizza, Patxi Pizza, Pi Pizzeria, Pie Five, The Pizza Press, Rotolo’s Pizzeria, Urban Bricks, Villa Italian Kitchen and Your Pie also offer similar deals. You can also get a cheap piece of pie at Coco’s Bakery Restaurant, O’Charley’s, Pick ‘n’ Save, Vilage Inn, Wesco and more. Marie Callendar’s has a coupon on their website that can be used to score a free piece of pie on Pi Day. If you’re local to one of their 16 shops, you can get a free pie slice from Grand Traverse Pie Company. Getting married? You can even get a free wedding from regional chain &pizza, which converts their stores into wedding chapels. They offer free weddings, including pizza, on Pi Day! They have locations in DC, New York and Philadelphia. You can also get discounts at Bakers Square, Bojangles’ and Boston Market (on pie, not weddings). On St. Patrick’s Day, you can get a free sample of their Mint Chip n’ Oreo Cookies Milkshake from Baskin-Robbins! Celebrate the first day of spring with tasty freebies! The first day of spring isn’t the same every year so this national food day usually occurs sometime between March 19 and 21. Rita’s Italian Ice provides free shaved ice. They gave away almost one million free cups in just nine hours in 2016. Dairy Queen offers free small vanilla cones on this day, also. Mall locations do not participate in this promotion. Ben & Jerry’s Free Cone Day happens sometime in early April, usually between the 4th and the 10th. This tradition has continued since 1979. You can sign up for an email reminder on their website! Every year, WaWa celebrates their anniversary by giving out unlimited free coffee. The convenience store was actually established on April 16, 1964, but the free WaWa day doesn’t always occur on the 16th. In 2018, it was on April 12. Unfortunately, Tax Day occurs every year also. It’s usually on April 15 but the deadline may fall sometime between the 16-18 depending on weekends, holidays and tech glitches. Paying taxes isn’t much fun (unless you’re getting a refund). As a consolation prize, many restaurants offer freebies and this has become one of the most abundant free food days during the year! Arby’s offers free curly fries. Cinnabon offers two free Cinnabon bites. Great American Cookie offers one free cookie to each customer. Hardee’s offers free sausage biscuits in the morning. Use the password “made from scratch” while ordering to receive this discount! Hot Dog on a Stick offers one free Original Turkey or Veggie Dog to all customers. Kona Ice Trucks offer free shaved ice. Sonic offers half-off burgers! It’s not exactly free but I love Sonic so I had to include this. Sorry! Evos offers free organic milkshakes on Earth Day! This chain is local to the Florida area. There are few foods I love more than fresh salted pretzels and cheese, so this is one of my favorite national food days! I’m thrilled that so many major pretzel chains participate in the National Pretzel Day freebies. You can get free pretzels from Philly Pretzel Factory, Pretzelmaker and Wetzel’s Pretzel’s. In addition, Ben’s Soft Pretzels will provide free pretzels with an on-site donation to the Intrepid Fallen Heroes Fund. If you’re willing to make a purchase, then you can get a BOGO deal on pretzels from Auntie Anne’s. Cumberland Farm’s will give you a free “Chill Zone” beverage with your pretzel purchase. Every year, Carvel provides free ice cream during their annual Free Cone Day. The cones are limited to select flavors in the junior size. The date varies, but every spring Haagen Dazs offers free ice cream cones! Follow their social media channels for updates. There are many more restaurants that offer discounted meals. For example, you can get 50% off at MOD Pizza and PDQ. You can also get 20% off Einstein’s Bagels. Every year on May 5, you can find excellent Cinco de Mayo deals at most Mexican restaurants. Moe’s Southwest Grill usually offers a freebie but it may be limited to a certain number of customers. On the Border offers free chips and salsa, as well as some drink deals. Taco Time may also offer a discount. Nurses have a tough job! That’s why so many restaurants and retailers make a point of thanking them for their efforts each week during National Nurses Week. Buca di Beppo has historically offered free meals for nurses with ID. Cinnabon offers a free Cinnamon Classic Roll, MiniBon Roll or four-count BonBites. Dunkin Donuts offers a free 16 oz beverage during certain hours with a valid health care ID. 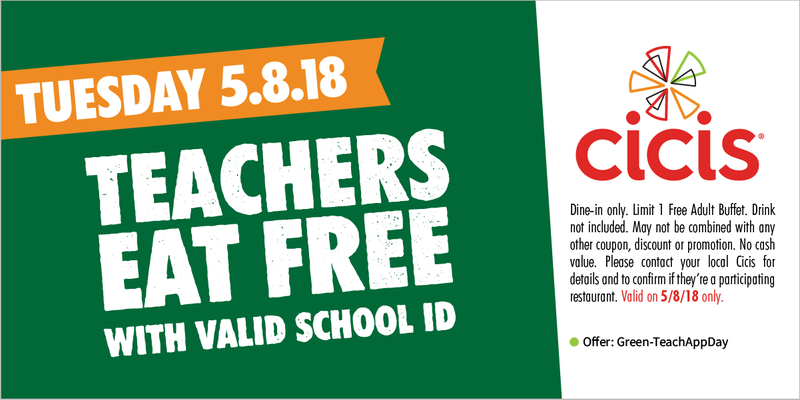 In addition to these freebies, nurses can also enjoy discounts at Jimboy’s Tacos, Pollo Tropical, Potbelly Sandwich Shop, Texas Steakhouse & Saloon, Culvers, Freebirds World Burrito, PDQ, Scooter’s Coffee and more. Chipotle offers a BOGO deal on burritos, bowls, salads and tacos for nurses, but their discount date may not correspond with National Nurses Week. Mother’s Day is traditionally celebrated on the second Sunday of May. Take your mother out to enjoy some freebies! You can get a free cup of frozen yogurt from TCBY. She can also get a free red velvet cake donut and a small coffee at Lamar’s Donuts and Coffee, although they sometimes celebrate this the Saturday before Mother’s Day. Although national chains like Jack in the Box often host some kind of BOGO or with-purchase deal, you can sometimes find better deals at local restaurants. For example, Bareburger gave away free Standard or Farmstead (vegan, gluten-free) burgers for National Hamburger Day 2017! Like Veterans Day, Memorial Day is filled with deals and freebies for retired and active members of the military. Firebirds Wood Fired Grill offers a free lunch or dinner to veterans and active-duty military. McCormick & Schmick’s invite military and veterans to get a free lunch or dinner entree from a select menu. The menu includes buttermilk fried shimp, parmesan crusted chicken, tender beef medallions or beer battered fish and chips. MOD Pizza offers a free 11-inch pizza or salad to those with military ID. Ninety Nine Restaurants invites military and veterans to choose one free entree from the $9.99 menu as long as there is another meal purchased at the table. Shoney’s offers a free All-American burger to those with military ID. This offer is limited and may sell out. Twin Peaks provides a free meal from a special menu to those who are veterans or serving on active duty. In addition to free food at restaurants, those with military ID can expect free admission for their entire families at many zoos, museums, and theme parks. Blue Star Museums offer free admission from Memorial Day through Labor Day! We love National Donut Day! Our favorite go-to donut shop is Krispy Kreme. You can celebrate this with a free original glazed donut from Krispy Kreme. You can also stop by Dunkin Donuts to get a free donut with any coffee purchase. Edible Arrangements also offers a free Edible Donut, which is really just a dipped apple. Walmart sometimes gives away a free whole glazed dontu to shoppers on National Donut Day, too! TCBY offers a free 6-ounce frozen yogurt to dads on Father’s Day! Dads can also score a free chili dog from Wienerschnitzel if they bring in proof of fatherhood, like a picture of their kid (or their actual kid). The Tropical Smoothie Cafe gives free smoothies to all customers wearing flip flops on this day! Every year, Chick-Fil-A hosts a Cow Appreciation Day. Dress up in a cow costume (or any sort of cow apparel) during business hours and you’ll get a free entree. On the 11th of July (7/11), you can score free Slurpees at 7-Eleven! The best freebies seem to come from convenience stores. I’ve heard that QuikTrip, Pilot Flying J and Love’s Travel Stop all offer free hot dogs on this day. You may need to download an app to access the discounts, however. You can get great deals on hot dogs from Ben’s Soft Pretzels, 7-Eleven, Dog Haus, Hwy 55, Hopdoddy Burger Bar, Philly Pretzel Factory, Sonic Drive-in and more. You can expect great discounts and free upgrades on ice cream from Baskin Robbins, Sub Zero, Carvel, Friendly’s, Wienerschnitzel and more. They aren’t exactly free but the coupons do make it much more affordable. Pets can enjoy National Ice Cream Day, too! PetSmart has been known to distribute ice cream sundaes with dog-safe vanilla soft serve and dog biscuits. A&W serves up their signature treat for free between 2pm and 8pm! Just stop by and pick up your free root beer float! You can get the details on their website. If you love lemonade as much as I do, then you aren’t going to want to miss this! Hot Dog on a Stick will provide a free small lemonade when they make a donation to the charity of the restaurant’s choice. Ahoy, matey! Can ye natter like a pirate? If ye can, ye can get a free donut at Krispy Kreme ‘n a free order o’ fish at Long John Silvers! Coffee aficionados rejoice! On September 29, you can score a free coffee from Peet’s Coffee, Krispy Kreme, Sheetz and McDonald’s! Use the code word “taco life” to score a free taco from Chronic Tacos! You can also use this coupon to get a free Chicken Taco al Carbon from El Pollo Loco! Green Leafs offers a free street taco with this coupon. Free tacos are available from TacoTime, Taco Cabana, Jimboy’s Tacos and Taco John’s. New Jersey chain Bubbakoo’s Burritos will sell each customer up to 5 tacos for just $1 each. cos, On the Border, Taco Bell, Taco Bueno, California Tortilla, Chuy’s, En Fenix, El Polla Loco, Rubios and more. You can also pick up a $3 Boo-rito from Chipotle and 50 cent corn dogs from Sonic! If you’re a kid, you can score even more freebies! However, please pay attention to the age limits on these and call your participating location to confirm the details. Offers may vary by election year. Be sure to call ahead for details! There is a lot of free food available for veterans and active-duty military on Veteran’s Day! To see the full list, you’ll need to click here. Sweet! National Cookie Day is a great time to gobble up some free sweets from restaurants and retailers around the country. Quiznos offers a free toasted cookie with any purchase. You can choose between oatmeal raisin, chocolate chunk or cinnamon sugar! Insomnia Cookies also offers free warm cookies on National Cookie Day. Their flavors include sugar cookies, M&Ms, chocolate chunk, double chocolate chunk, oatmeal raisin, white chocolate macadamia, snickerdoodle, double chocolate mint and peanut butter chip. Pei Wei, Schlotzsky’s Deli, and Insomnia Cookies will give you a free cookie with purchase. For more than 20 years, Sheetz has distributed free coffee on Christmas Day. I would veruy much like to thank you for all your hard work and countless hours you invested in bringing this wonderful and very useful information to myself and those alike. I am fighting for my disability and while i dream of working and providing as i have in the past for my children i cant as hard as i have tried. I cant stand longer than an hour without my legs swelling up like telephone poles and the most intense pain imaginable. As well i cant sit long from the back pain that makes me contiplate my existance, not to mention after 5 minutes my legs and feet go numb and i fall on my face and i have broken the bones om the top of my right foot from getting up and atemping to walk to my door after sitting down in the same position for about 10mins. Gotta change positions frequently. So those and my depression and panic dissorder have made to working is not possible and i feel like a pos for it. We have been evicted and homeless several times in the past few years, utilites shut off and i kno one can guess how buying necessities and other things have been impossible. I do recieve snap benifits thank goodness only its just never enough. I dont know how things will go but i appreciate the help and hopefully someday all the good things i have done and how much i have helped others may come back around. It would be great for my kids to see that we are not the only good big hearted people around cuz they have asked if there are other people that are so kind, caring ans giving. And of course i tell them there are, just far and few. But again i really appreciate the help for my family and all those others out there in need as well. Thank you have a blessed day. I’m so sorry to hear about all your troubles. Thank you so much for taking the time to reach out to us with kind words. We really appreciate it. Have you checked out our posts for Food Stamps and Help for the Disabled? I hope this helps.